The Indian Navy's elite marine commandos will this month be armed with Israeli assault and rifles that will enhance their operational capability as a force trained for special operations. A consignment of over 500 TAR-21 Tavor assault rifles and another 30 Galil sniper rifles worth over Rs.15 crore ($3.3 million) and Rs.2 crore respectively was delivered to the MARCOS (marine commandos) in December 2010, a defence ministry official told reporters. A team from the Israeli Military Industries (IMI), the manufacturer of the specialist weapons, will be in India to carry out joint inspection of the consignment's post-delivery quality to ensure the weapons are in fighting-fit condition. "The lot of over 500 Tavor and 30 Galil rifles has arrived and the Israeli team will be here to jointly inspect the delivered weapons and for assembling them. The MARCOS will begin using these rifles and start training on them from this month," the official said. He did not wish to be identified because of ministry rules. The defence ministry had placed the orders for the rifles for the MARCOS - their actual strength is classified - in 2008. The two weapons are already in use with the Indian Army's special forces and the Indian Air Force's Garud special forces units. The army's special forces got about 3,000 of the Tavors and another 1,000 of the Galils some time in 2004, for which they had placed orders in 2002. 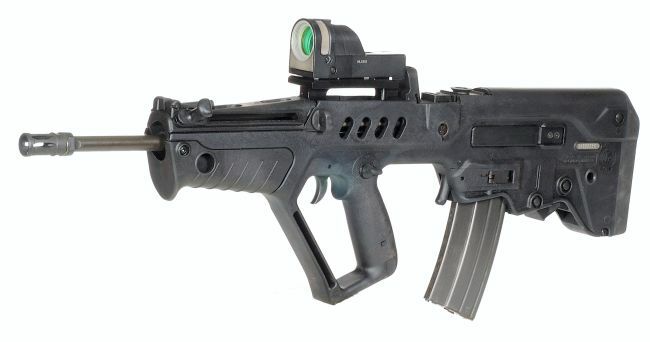 The Tavor, a 5.56mm calibre weapon of NATO specifications, is a 21st century assault rifle from IMI. The MARCOS have been using the indigenous INSAS rifles and the Russian Kalashnikov variants. The Tavor would also be a standard weapon for the force from now. The Galil is a 7.62mm sniper weapon, again manufactured by IMI, popularly known as Galatz in the Israeli defence forces. It is a DRDO product, but Ulhasnagar me "Made in Israel" ka stamp laga diya hoga.. The term assault rifle is a translation of the German word Sturmgewehr (literally "storm rifle", as in "to storm a position"). The name was coined by Adolf Hitler to describe the Maschinenpistole 43, subsequently re-christened Sturmgewehr 44, the firearm generally considered the first assault rifle that served to popularise the concept and form the basis for today's modern assault rifles. Its ammunition must be supplied from a detachable magazine. Rifles that meet most of these criteria, but not all, are technically not assault rifles despite frequently being considered as such. For example, semi-automatic-only rifles that share designs with assault rifles such as the AR-15 (which the M16 rifle is based on) are not assault rifles, as they are not capable of switching to automatic fire and thus not selective fire. Belt-fed weapons (such as the M249 SAW) or rifles with fixed magazines are likewise not assault rifles because they do not have detachable box magazines. However, in this case, the M249 SAW has the ability for both being fed by belt or detachable box magazine. The term "assault rifle" is often more loosely used for commercial or political reasons to include other types of arms, particularly arms that fall under a strict definition of the battle rifle, or semi-automatic variant of military rifles such as AR-15s. The US Army defines assault rifles as "short, compact, selective-fire weapons that fire a cartridge intermediate in power between submachinegun and rifle cartridges. Last edited by ashdoc; January 12th, 2011 at 10:51 AM. In military and law enforcement terminology, a sniper rifle is a rifle used to ensure more accurate placement of bullets at longer ranges than other small arms. A typical sniper rifle is built for optimal levels of accuracy, fitted with a telescopic sight and chambered for a military centerfire cartridge. The term is often used in the media to describe any type of accurized firearm fitted with a telescopic sight that is employed against human targets, although "sniping rifle" or "sniper's rifle" is the technically correct fashion to refer to such a rifle. The military role of sniper (a term derived from the snipe, a bird which was difficult to hunt and shoot) dates back to the turn of the 18th century, but the true sniper rifle is a much more recent development. Advances in technology, specifically that of telescopic sights and more accurate manufacturing, allowed armies to equip specially-trained soldiers with rifles that enable them to deliver precise shots over greater distances than regular infantry weapons. The rifle itself could be based on a standard rifle (at first, a bolt-action rifle); however, when fitted with a telescopic sight, it becomes a sniper rifle. Last edited by ashdoc; January 12th, 2011 at 11:03 AM. Sniping was evolved into a fine art by the germans in the world wars using telescopic sights which had Carl Zeiss lenses . Classic example of half-assed knowledge! These weapons - Tavor and Galil are not your standard issue weapons. They are weapons issued to special forces in the Army's Para SF (4000+ already) and now, the Navy's Marcos (1500 only, the Marcos are 7000+ strong force, leaving the rest with MP5 SMGs). So, that leaves the 1.1+ million strong Indian Armed forces with their standard issue assault weapon - INSAS 5.56mm rifle. Now, guess what! INSAS has been exclusively developed by DRDO and OFB using design characteristics drawn from both AK-47 and FN-FAL. So, in short, majority of our forces still use DRDO developed INSAS weapons system.
. So, in short, majority of our forces still use DRDO developed INSAS weapons system. How unfortunate! We might as well send them out to battle with sticks and stones! At least those will break bones. Maybe they can use their rifles as clubs to bludgeon with!